These days, social networking apps are the hub of our online life. They entertain us, bring us together, let us communicate, and explore. Therefore it's imperative that any mobile platform provides a great experience for working with networks, such as Twitter, Facebook, LinkedIn, etc. 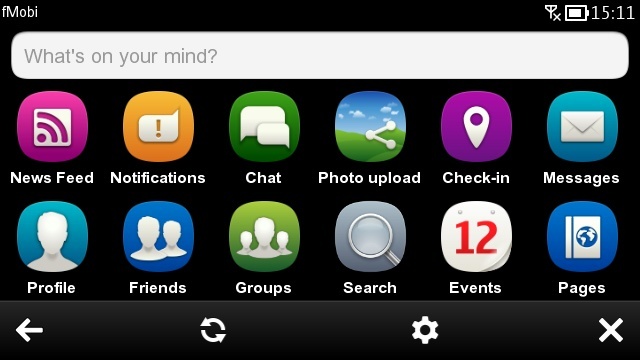 Symbian has long enjoyed the powerhouse of Gravity for Twitter, Facebook, and others; but in the last 12 months it has been joined by a set of impressive Qt-based applications. Here we gather together the reviews of our favourite applications to cover all of your needs. LinkedIn is the lesser publicised social network aimed squarely at professionals. Its core features are sharing links, participating in group discussions, and making new contacts. The client provides access to all the core functions - for example, users can read and post status updates, with an option to have the update tweeted. LinkedIn provides a home screen widget, which gives an overview of one's invitations and inbox messages, along with a search link. There are quite a few Facebook applications for Symbian, however a favourite in the All About Symbian (virtual) office is fMobi. It is one of the most feature-complete Facebook applications on any platform, and has a unusual style mimicking the Symbian application menu. 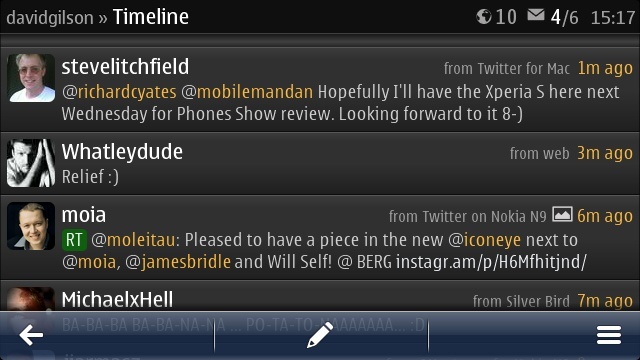 Written purely in Qt, there's a Symbian Belle-like interface throughout (top status bar, 'Back' button, etc. ), full kinetic scrolling, an (optional) innovative side-tab system that works surprisingly well. Plus an icon-based homescreen that's attractive. 'Fluid' is the word that best sums up fMobi's interface. A beautiful feed of thumbnails, updates and comments, all presented in a kinetic scrolling list. And everything has 'like' and 'comment' function icons. I liked the Friends browser, combining a side scrolling alphabet index with vertically scrolling names. You can also respond to Facebook friend requests here. Facebook messages load quickly, and a nice touch is the thumbnails of each cc:ed recipient. This was tested on an N8 with a few hundred photos in my Photos gallery - more optimisation needed here, I think. Even just displaying thumbnails for the last 20 photos (say) would work better. Anyone who has a Symbian device will hear about Gravity sooner or later. While it's one of the more expensive applications out there, it's worth every penny and is a staple of any power user's application suite. The author, Jan Ole Suhr, is the most socially engaged developer I've encountered - constantly dealing with bug reports via Twitter and offering advanced beta versions for customers to try. Ewan first reviewed Gravity in 2009, more recently Steve wrote about a more recent version in "Gravity - the Facebook client you didn't know you had". 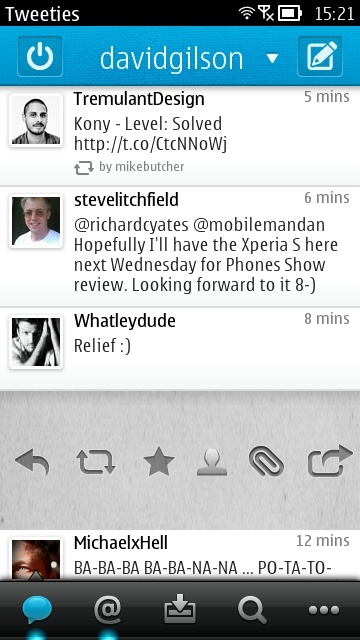 Gravity is an impressive bit of software and is a wonderful advert for Symbian developers. 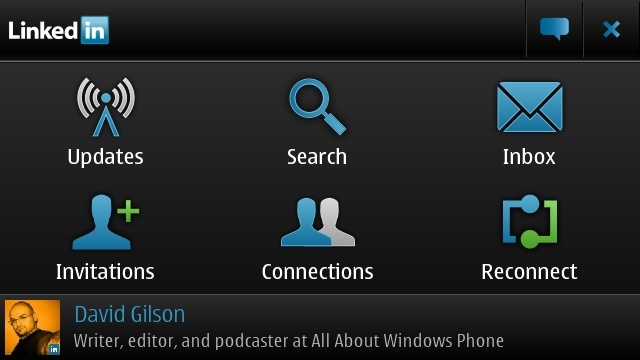 It demos wonderfully to groups of people; the UI is polished, slick and understandable (even though its following very few S60 standards); the registration system is one of the slickest on Symbian we've seen in a very long time; the update system means the many updates that could be seen will be missed by very few people... it all adds up to an applciation that is something special in the Symbian World. Hopefully Twitter users will register and allow for continued development, but even if it stopped now then it's still one of the most professional apps on S60 in the last few years. I'd argue it's better than most of the desktop Twitter clients as well, and easily an equal of Tweetdeck (the most popular third party Twitter client, after using the native web site). I've no hesitation in awarding it a score of 90 and an AAS Mega-app award, and urge anyone on Twitter to take a look. Interface, speed, cosmetics, stability. Superb, very smooth and fluid, and with a choice of OLED friendly or traditional black on white themes, and a choice of fonts. Updated regularly too, with extra bells and whistles. Status messages/news feed. Very smooth again, commenting and liking is easy. Facebook email. Handled in the same way, as a scrolling pane with context-sensitive options. Works well. Photo browsing. This is limited in comparison to the likes of fMobi and Facial - but for ad-hoc "oh, look, there's a new pic from Bob" use then Gravity is adequate. Media sharing/upload. 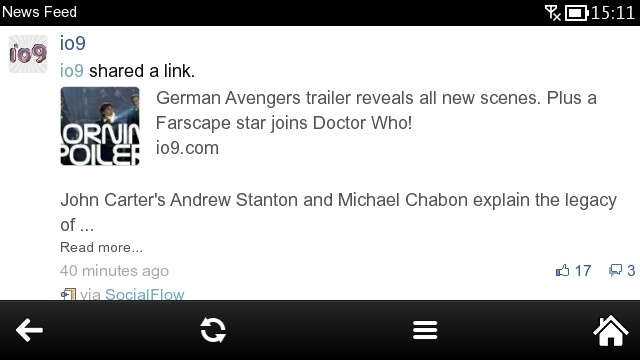 Super, it's only a couple of taps to share an image. Shame about the Facebook resolution limitations, but that's not Gravity's fault. Other features (Groups, Tags, etc.) There are no extras with Gravity. Facebook keeps piling on the features, month by month, and it's starting to really annoy me. Rather splendidly, Gravity plucks the wheat from the chaff and you're spared Facebook's inane privacy, grouping and sharing covolutions. 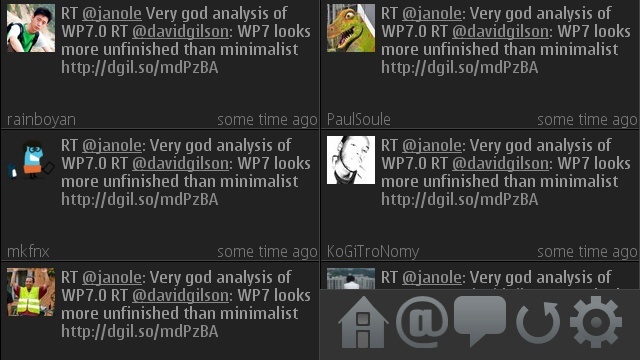 Tweeties is a relatively new Twitter client, and has an almost complete feature set. The unique selling point of Tweeties is that it has been closely modelled on the style of Twitter's official application. I found some small user interface issues, such as inconsistent use of the split screen keyboard. Overall though, it's an attractive application that works well. If you’re a casual Twitter user and want to move beyond the limitations of Nokia Social, then Tweeties is a good alternative – especially if you think Gravity is too expensive. I have a reservation with Tweeties’ performance though, as downloading tweets can sometimes take an unfeasibly long time. 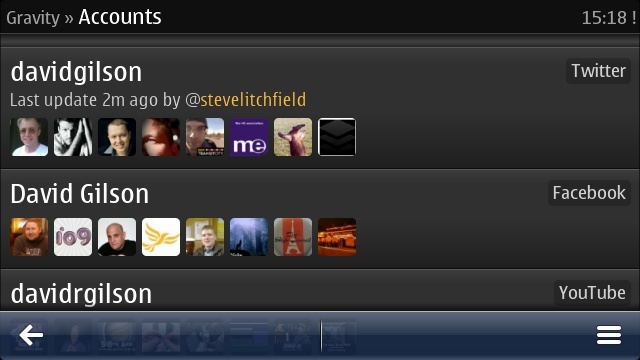 Still, if you’ve used the official Twitter client on other devices, you’ll find Tweeties very easy to use. 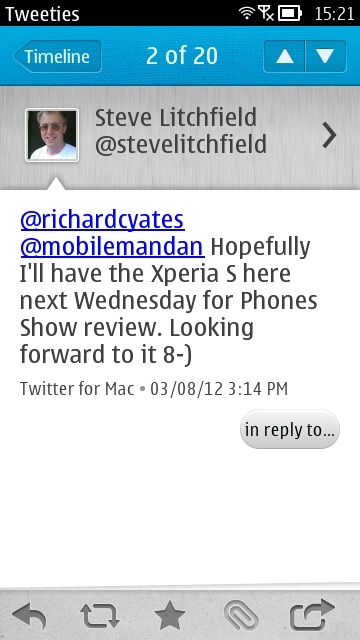 Similarly, if you’re planning to move away from Symbian, then Tweeties will prepare you for the official Twitter client. TwimGo was one of the first headline applications written in Qt, and is even available for the Maemo powered Nokia N900 and the MeeGo Harmatten Nokia N9. 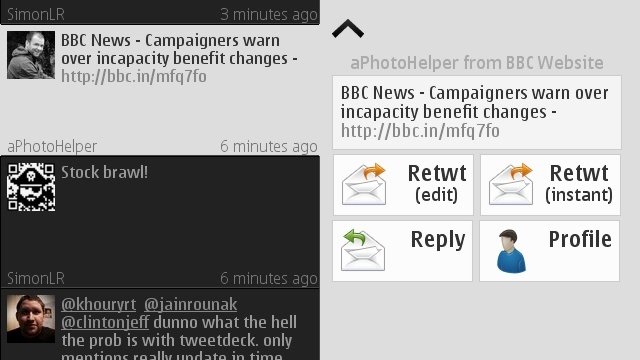 Its user interface has a resemblance to Gravity and TweetDeck. Not everything is intuitive, but the main benefit is that it's free of charge. The only thing it can't do, that the built-in Nokia Social can, is upload images. When viewing the profile page of a Twitter user, you get the basics of following (or unfollowing), viewing their tweets, sending a direct message, and creating a public tweet to them. However, there are no options to add or remove them from a list, block them, or report them for spamming. When turning a Twitter profile into landscape orientation, you're greeted with a split screen view, requiring you to scroll through the profile function buttons on one side, and scroll through your timeline on the other (see the sixth screen shot). This is certainly original, but I fail to see why you would want to do both at once. David Gilson, 8th March 2012.